I’ve harped on quite a bit on my blog, and YouTube Channel about my upcoming 40th birthday. 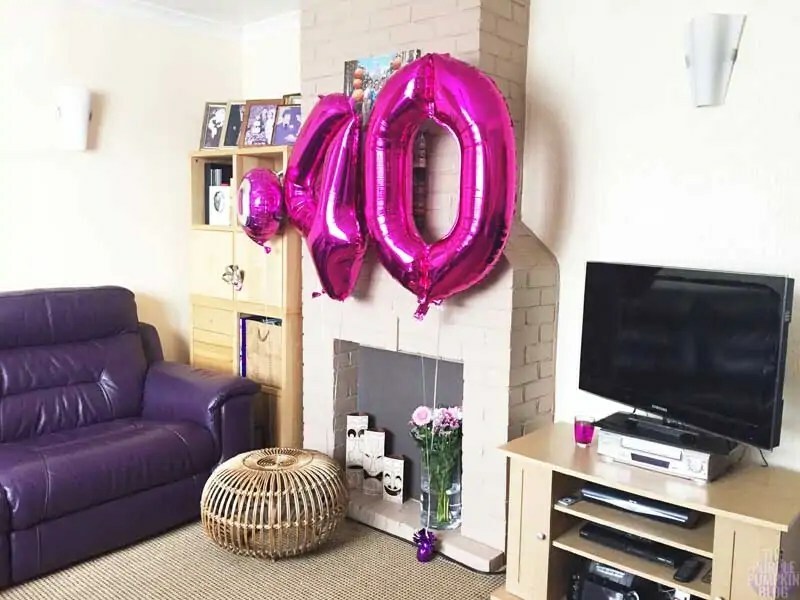 I wanted to celebrate this milestone age with my family and friends, and the only way to do it was to have an early unbirthday party, as we are on holiday for my actual birthday in September. 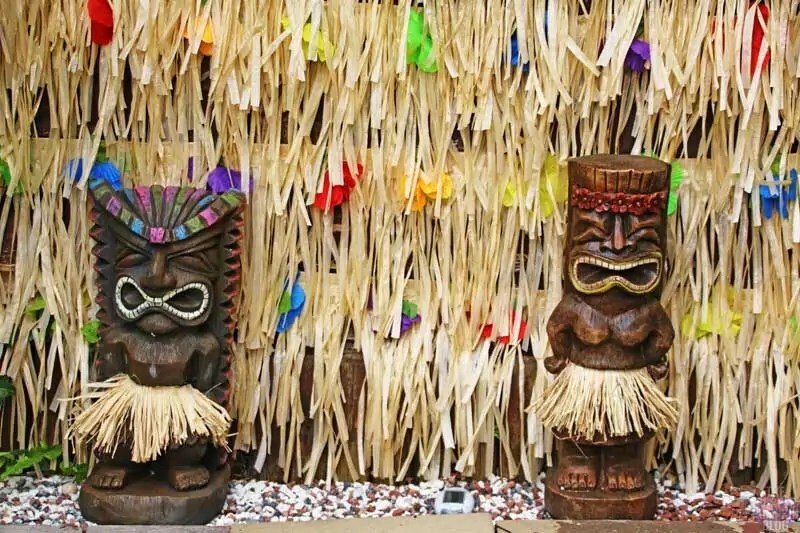 I’ve already shared the big DIY project for this party, which was the Tiki Bar, but I want to share some of the other photos from my party. I’m going to disclaim right from the start that in my eyes, my party planning was not to my usual standards. I bought all the food pre-prepared from the supermarket, when I initially had plans to make the party food from scratch; I didn’t create any printables; I forgot to use some of the things that were sent to me by companies, to use at this party; and I left my husband, parents, and son to set up a lot of things as I was feeling stressed, tearful. Plus I had to get myself ready with make-up and hair, that just wouldn’t go right! As mentioned in other blog posts, WF Denny, and Amscan (via Party Delights) sent me lots of decorations to use. The decorations were set up by Steve and myself (Liam was at work) and it took us quite a while to decorate the garden! To that end we ran out of time to use the awesome scene setters from Amscan, which I was going to put up in the kitchen to hide the ugly walls. But they’ve been put away now, and I’m pretty sure this theme will come back to one of my parties in the future! I think my favourite decoration of all was the deck fringe which you can see along the top of our fence, and with the leftovers, we completely covered a (falling down!) fence panel. We bought the tiki statues in front from Asda, and I love them! The tiki piñata was not smashed to bits, but we have bought some toys and sweets to go inside it, so maybe we’ll have to ceremoniously do that next weekend or something! The inflatable parrot must have had a leak somewhere as he started to slowly deflate every time we blew it up! We had some outdoor fairy lights to go in the palm tree and around the bar – but do you think we could find them? No. The inflatable palm tree on an island fared a lot better – it was filled with ice and cans of drinks. We spent ages putting the fairy lights inside the gazebo, before hanging up some of the other Hawaiian decorations. All in all, it looked very tropical in the garden! I curated a huge Hawaiian Party Food blog post a while ago, and I had big plans to make some of the recipes within for my unbirthday weekend, but I didn’t… I wanted minimal stress for the big party on Saturday night, so thought it would be a lot easier to just buy pre-prepared food from the shops instead. The original plan was to have a Hawaiian themed barbecue on the Sunday with my family, but as there were lots of leftovers from the night before, we just had those instead. One of my aunties arrived on Sunday for the family do, with a tray of one of my favourite Greek-Cypriot cakes called kok. They are a bit like whoopie pies, with a custard sandwiched between two discs of sponge, and topped with chocolate. Nothing much to share, in the way of awesome photos – as I was too busy chatting to my friends and family in the garden, which others set the buffet up, but there are a couple of quick snaps. I had such big plans for the buffet but it didn’t turn out that way. I’ve not thrown a big party for a few years now, and I’m really out of practise. If anything, this party has reminded me just how much I do love to plan and throw parties at home. I’m sure it won’t be long before I’m on top form again. For drinks, we of course served them from the Tiki Bar, with my son acting as barman! We bought lots of cans of soft drinks, beer, cider; as well as boxes of fruit juice, wine, and bottles of pre-made cocktails. I was also sent some juices from The Cracker Drinks Co. – Mango & Passion Fruit, and Pineapple, Coconut & Lime. We’ve got lots of leftover drinks, which isn’t too much of an issue as they last for a while, and there is likely to be another family barbecue before the summer is completely gone. The Cracker Drinks Co. juices were delish – my favourite was the mango and passion fruit. The coconut cups that I was sent were the perfect vessels for the tropical drinks! You can’t have a birthday party without cake, and my parents bought this positively tropical looking cake from a local cake shop. It was lighter than air, covered with fresh cream, and with all that fruit, it was pretty much zero calories!!! 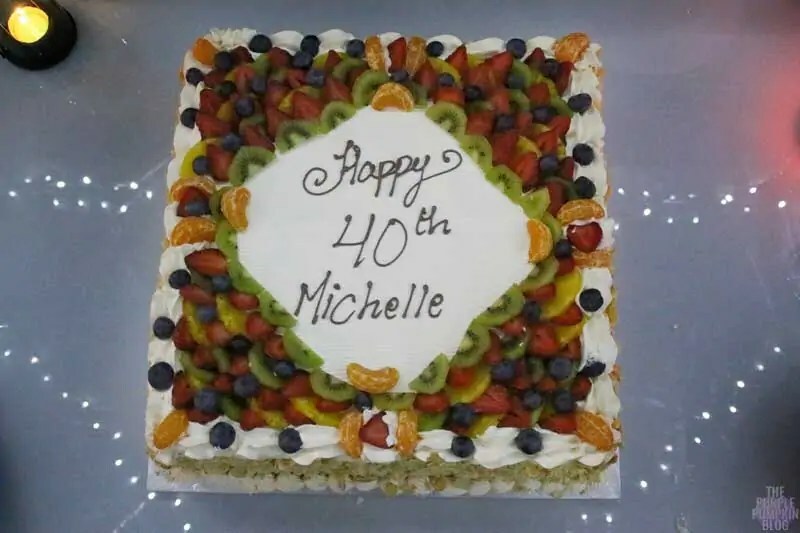 The cake was HUGE, but over the course of the weekend it was mostly eaten by my guests – with a slab left over which we ate direct from the cake board itself – very classy! Instead of forty candles (because I’d need a fire extinguisher to blow that lot out) I bought 4-0 sparklers instead. Only problem was getting them to both light at the same time! By the time Steve got the zero to light, the four was burned out… I’ll be making my birthday wishes though on my actual birthday on 14th September! And what is a party without the people? Some friends couldn’t make it, which was such a shame, but I’m so grateful to all those who did make it. My best friend of nearly 30 years came down from Leeds, with her daughter and fiance; my other bestie and fellow blogger switched her own birthday plans to come with her family – I’ve not seen all of these people for about a year now, so it was so lovely to have them all with me to celebrate! Another friend was late after being in Birmingham all day watching her son play American Football, but I was delighted she made it, as not seen her a couple of years either! Then there was all my family, and long-time family friends as well. On the Sunday my aunties and cousins (who live a distance away) came to celebrate, so it was such a fab weekend of seeing people that I don’t see very often thanks to distance. What I found really weird was being that middle generation of our family. I remember when my parents, and aunties were 40… and now I’m at that point! There are new additions to the clan, with my niece, and my cousin’s son, and seeing everyone together, made me very happy. The kids had a great time – especially putting on as many leis as possible! 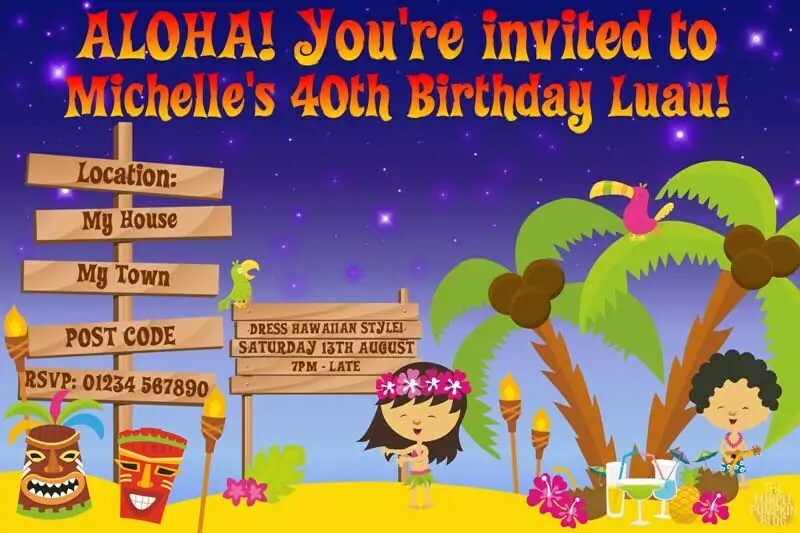 I’ll close out with these photos, and I’ll update you with what we did for my actual 40th when we return from Florida! Great to have such a colourful theme – looks amazing. Looks like a blast! I find all the preparations for my children’s birthday parties stressful enough so I don’t bother with any for myself. I hope you have a great actual birthday in Florida. Ahh! It looks like you had a wonderful party! It looks like you had a fab time. I love all the pictures and the smiles. What an ace party planner you are.